The Elves have been watching too many ’80s movies again, and thus our recent posts seem to have gone a bit ‘red braces’. Still, no matter, because if the results of their historical television watching are as good as this we’ll happily indulge them. This is a Ferrari 288 GTO, closely related to (and built alongside) yesterday’s 308 GTS, but with its V8 slightly de-bored (made smaller) and turned longitudinally, to make room for a pair of turbochargers, a pair of intercoolers, and a whole lot more power. This foray into forced induction delivered some incredible results too, as the 288 GTO was the first production car to reach 300kmh (186mph) – way back in 1984. This lovely Model Team / Creator style recreation of one of Ferrari’s most legendary models comes from Daniel H of MOCpages, with opening doors, hood and trunk, pop-up headlights (controlled from inside too! ), and a detailed interior and engine bay. Daniel is hoping his creation will become an official LEGO set via the Ideas platform – if you like it you can see all the photos, and add your vote to LEGO Ideas, via the link to MOCpages above. LEGO’s diminutive 4-wide town vehicles are kinda cute, but they are also a bit lonely for the poor mini-figure at the wheel, as they can only fit one mini-figure inside (and even then only with the windows down). However, a slight scale up to 7-wide and a very clever cabin design allows your mini-figure to take a friend along for the ride too. TLCB newcomer James C’s lovely classic Pontiac GTO works treat, and you can see more how he’s done it on MOCpages. With the news that FCA (Fiat Chrysler Automobiles) is putting the world’s largest manufacturer of crappy branded merchandise – Ferrari – up for sale, we thought we’d step back to a time when the prancing horse built cars, and only cars. This was one of their finest, the glorious 288 GTO. Senator Chinchilla – who’s becoming something of a regular here – is the builder, and you can see more of his Model Team 288 GTO on Flickr at the link. 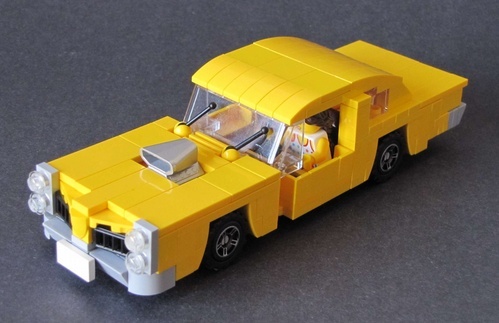 This incredible first-generation 1965 Pontiac GTO was unearthed on Brickshelf. Featuring opening everything (with operational locks), a working V8 engine and one of the nicest interiors we’ve seen in ages, the full gallery is well worth perusing. Paliason is the builder, and you can see more of his superb creation here.